Egg-White Omelette cooked in Coconut Oil on top of Ezekiel toast covered in 2% Cottage Cheese. Finally, it is topped off with a glob of Pace Picante Salsa, and sprinkled in crushed Black Pepper. Toast one slice of Ezekiel bread, covered in cottage cheese in toaster oven for about 1.5 minutes. While this is toasting, spray heated pan with coconut oil spray and then put in egg-whites. Once they are 3/4 of the way cooked, flip over and finish in the pan. Once finished, take out and roll omelette up. 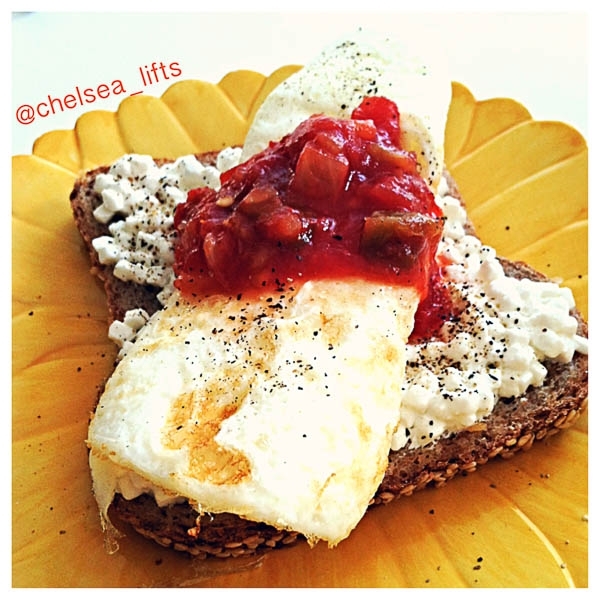 Take toast out, and place rolled omelette on top of cottage cheese. Then, add Picante on top of the omelette and finish by sprinkling pepper over entire dish.